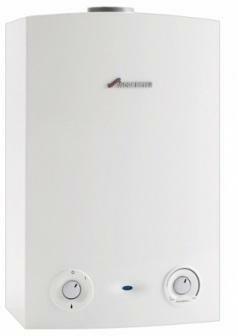 The Worcester-Bosch Greenstar 18Ri is a gas-fired condensing boiler of the regular or heating only type. The appliance casing which has maximum dimensions of just 600mm x 390mm x 270mm contains an efficient cast aluminium heat exchanger fan etc. but is suitable for wall mounting. The Worcester-Bosch Greenstar 18Ri is suitable for use on open vent and sealed primary water systems and rated A for energy efficiency by SEDBUK 2009 (Seasonal Efficiency of Domestic Boilers in the United Kingdom). Indeed the condensing nature of the appliance means that the heat contained in waste gases is recycled rather than disappearing out of the boiler flue. So the Worcester-Bosch Greenstar 18Ri can reduce domestic hot water and central heating bills by between 15% and 20% and the level of carbon dioxide (CO2) released into the atmosphere.